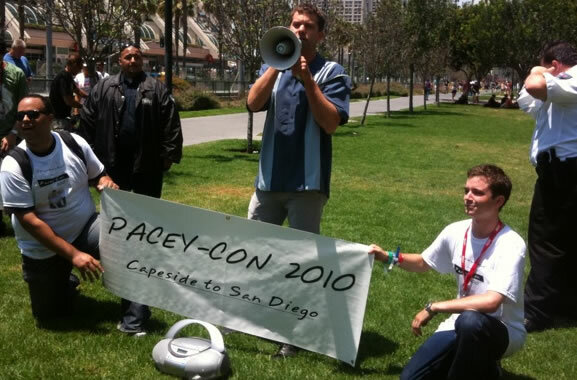 This past weekend hundreds of thousands of people took their annual pilgrimage to San Diego to celebrate Pacey-Con, the event celebrating all things Pacey Witter. Yes, the star of DAWSON’S CREEK (and most my dreams for the past 10+ years), took time out of his busy schedule to be one with the fans. To embrace the overwhelming love that comes with being the greatest character in television history. For ages the debate raged on. Was it Dawson or Pacey? Well my friends, I don’t see a Dawson-Con around, do you? That’s your answer. I was unable to attend this year’s Pacey-Con, but you can count on me being there next year no matter what. Restraining orders be damned! I will not miss another opportunity to be in the same vicinity with the man, the myth, the legend that is Pacey Witter. Until then, I will comfort myself by watching the DAWSON’S CREEK box set on continuous loop. Will you be attending next year’s Pacey-Con? What favorite Pacey episode would you like to talk to him about? “Stolen Kisses”…”True Love” — too many to even consider right now. Amazing. Josh is a great sport. Absolutely amazing 🙂 I’m working my way through my Dawson’s Creek DVDs this summer, so I’m completely in Pacey mode right now!! This is great! I love how he’s all decked out Pacey-style and everything. Ordered my Dawson’s box set (finally) last weekend. Can’t wait til it arrives! This is truly amazing. Hilarious. Fantastic. 10 points for the idea and ‘acting’, and all. Plus that shirt = Pacey. I definitely want to be there next year. Josh Jackson (and Pacey) both are great! Thank you for the video! “The Tao of Pacey?” Brilliant line, Kath! We’re very lucky to have young stars who don’t ignore the shows that made them bankable. Zach Levi praises his Less Than Perfect experience for helping him prepare to be Chuck, Kaley Cuoco still waxes poetic about her days on 8 Simple Rules, and now Mr. Jackson. How did he keep a straight face through that whole gag? He is a great actor. Love Joshua Jackson, in large part because he tickles my funny bone, and looks so handsome doing it too. I don’t know about Pacey…but I LOVE Josh Jackson. He’s so funny. Looks to me like he may have a little too much time on his hands with the new Fringe season 3 format. And thank God for it.